6. Verifying that the machine or equipment is isolated from the energy source. Although this is the general rule, there are exceptions when the servicing or maintenance is not hazardous for an employee, when the servicing which is conducted is minor in nature, done as an integral part of production, and the employer utilizes alternative safeguards which provide effective protection as is required by §1910.212 or other specific OSHA standards. § Notification of affected employees that the machine or equipment may be returned to service. 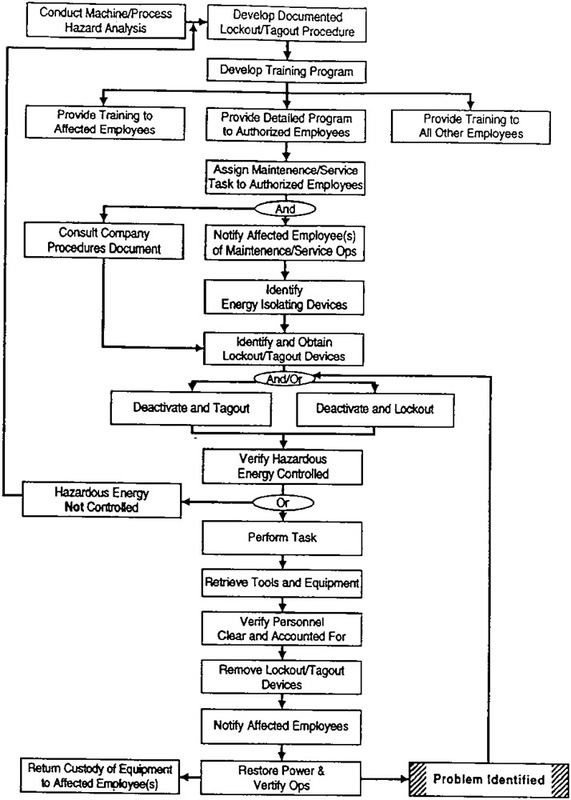 The steps to lockout described above are only a part of the total energy control program which must exist in the workplace. In addition, the employee should have written procedures for all machines and equipment, employees must be trained in their duties and responsibilities under the energy control program, and periodic inspections must be conducted to maintain the effectiveness of the program. 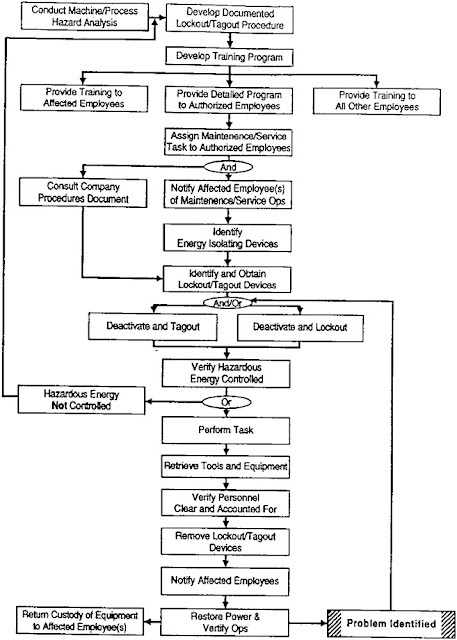 Figure 1 provides a functional flow diagram of the functions necessary during the conduct of a viable servicing/maintenance operation during which the equipment must be isolated and locked out. The maintenance and repair facility in the plant deserves consideration here. Are all the right tools on hand and in good repair? Are lubricating oils and other common supplies readily available and safely stored? Are commonly used machine parts and hardware kept in stock so that the crews are not encouraged (even obliged) to improvise, at the risk of doing an unsafe repair, or to postpone a repair job? And don’t overlook the possibility that maintenance equipment itself may need guarding of some sort. The same precaution applies to tools and machines used in the repair shop. Certainly, the maintenance and repair crew are entitled to the same protection that their service provides to the machine operators in the plant.